Featuring solid steam-bent hardwood and classic woven fabrics, the Stem lounge has appealing organic curves that flow into one another, cradling the user. 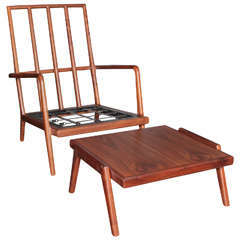 The use of bent-wood components allows for a lighter profile that is incredibly sturdy and comfortable. Each chair is constructed by Lutz Furniture in Fall River, MA from hand-selected American hardwood and custom-upholstered fabrics. Standard wood options include: While oak, walnut, beech, ash, Standard fabric options include: Salt and pepper, Royal navy. All chairs are built to order and can be customized to suit the client's specific needs. Lutz Furniture is a New England based furniture design company specializing in uniquely crafted hardwood furniture and objects. Founded by Peter Lutz on a commitment to radically rethinking what a piece of furniture can be through an alchemy of materials and processes. Peter’s approach to design incorporates his experience in a variety of disciplines from mold-making to machining to fabric to printmaking. Underlying every Lutz design is a tension between visually striking forms and a quiet simplicity of spirit. Peter's expertise in all aspects of furniture design and production allow him to provide a high level of customization and collaboration with designers, architects, and collectors. 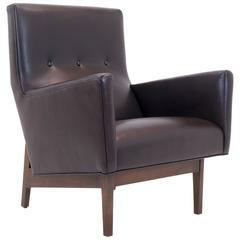 Sculpted walnut high rail back lounge chair by Smilow Furniture. Solid walnut frame. Chair is priced without cushions or ottoman. Designer: MRL Creative based on Maurice Martine design Manufacture: MRL Creative Period/style: 2018 / Mid-Century Modern style Country: US Date: 2018.